In this series, we review restaurants from an entirely vegetarian angle. While some restaurants will be specifically vegetarian, others will be mainstream. We’ll be tasting everything from veggie burgers, to posh meat-free menus. Along the way, we’ll try to find out, as far as possible, whether chicken stock, cheese made from animal rennet, gelatine, fish sauce and so on are not lurking in the supposedly vegetarian dishes. Trend-watchers have been so busy clocking the rise of Peruvian, Persian, Korean and Israeli cuisines in recent years, they’ve largely failed to notice that Modern Greek eateries have been quietly springing up around London. Perhaps Mazi got the ball rolling a couple of years ago; swiftly followed by cool, modern delis and cafés such as Carpo and The Life Goddess. We told you about the Ergon deli a few months back, which has a lovely restaurant too, and innovative-sounding deli-restaurant The Greek Larder is scheduled to open later this year. 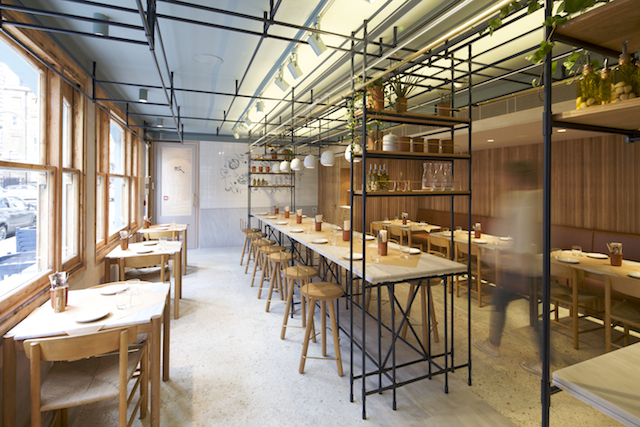 Last month Opso, a trendy all-day Modern Greek diner, opened near Baker Street. It’s a functional, stylish space with a pared-down contemporary look. 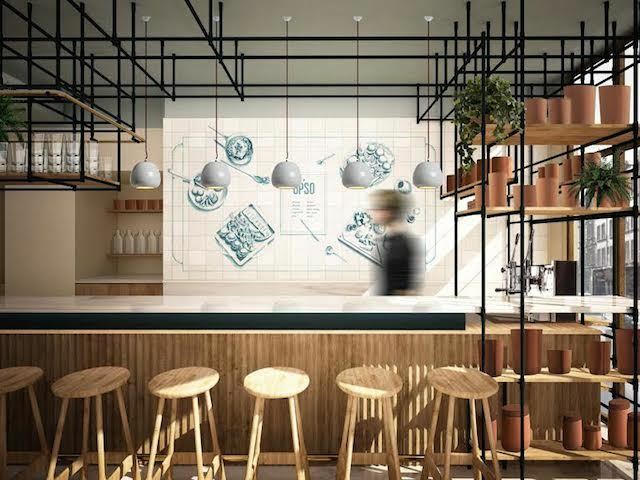 There’s a bar at the entrance with a grey marble-topped counter and a somewhat quirky display of items from the menu such as cookies and burgers. At the back, a raised communal table dominates the oak-panelled dining room; with banquettes to one side, and a few white marble-topped tables to the other. Large metal frames holding potted plants and ingredients such as beans in jars liven up an otherwise sombre colour scheme. Pretty mosaic-embedded tiles and, on our visit, lots of bright sunlight streaming through large plate glass windows, add a Mediterranean feel; as do al fresco tables. There’s another dining room and ‘larder’ in the basement, but it’s not yet open. Opso – an ancient Greek word for ‘delicacy’ – is founded by British-Greek entrepreneur Andreas Labridis and architect Dimitris Karampatakis, with input from consultant chefs Georgianna Hiliadaki and Nikos Roussos of two-Michelin star Funky Gourmet in Athens. Interestingly, it’s located opposite a branch of The Real Greek, and close to the Hellenic Centre. It aims to showcase the contemporary tastes and produce of Greece, such as honey and cheese, via ingredient-led cooking and a thoroughly London sensibility. In other words, don’t expect traditional recipes, or at least not in familiar guises. The communal table and the ‘small shared plates’ menu are meant to reflect “Greece’s social attitude towards eating” – but they reflect London’s current social attitude towards eating, too. 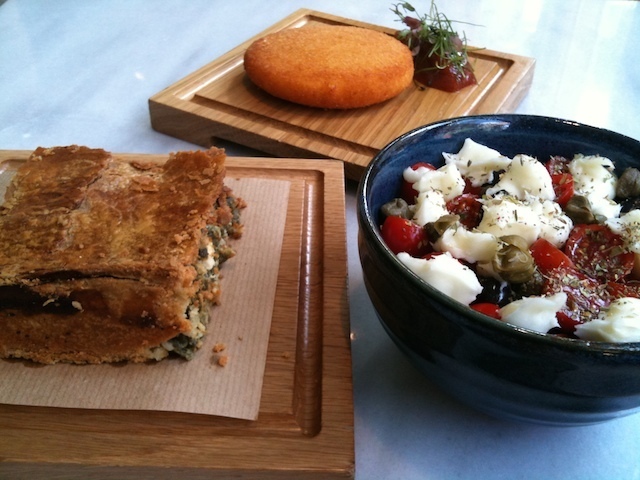 Unusually though, Opso serves Greek breakfasts and brunches – a rarity in London. (As the restaurant is very new, it serves breakfast, brunch, lunch and dinner on specific days – which will be changing and evolving as it becomes more established, so do check before visiting). To be honest, the most interesting-sounding dishes are meat- and fish-based; there isn’t a great deal of excitement for vegetarians on the all-day lunch menu. Nonetheless we liked all the items we tried. 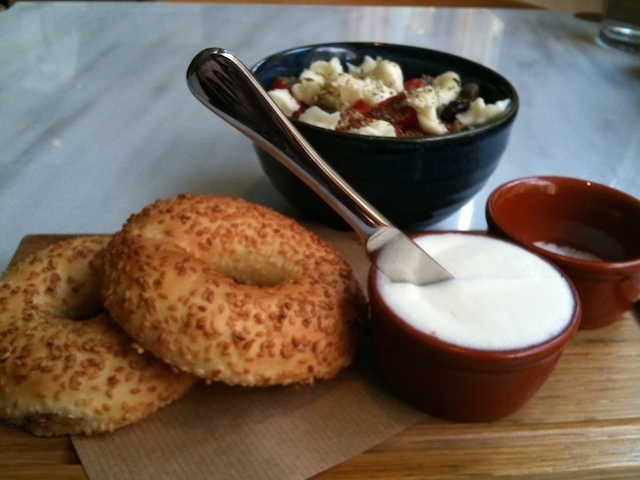 Bagel-like, sesame-studded toasted koulouri bread, eaten as street food or breakfast in Greece, comes with little pots of mellow goats’ milk curd and sea salt – simple but effective. A square slab of fresh spinach and feta pie has good, thin, crumbly deep-golden pastry (probably hot water crust) and slightly spicy, earthy flavour. A fried disc of orange-hued, breadcrumb-coated metsovone — the smoked cheese from Metsovo in northwest Greece — doesn’t look convincing as it resembles Findus crispy pancakes. However, we’re won over by the lightly smoky taste that doesn’t overpower, and the tart-sweet blob of accompanying own-made rhubarb jam. The cheese stays gooey upon cooling and doesn’t become rubbery, which is impressive. Dakos salad – featuring Cretan olive oil rusks – is much needed to cut through the richness of the cheese-and-carb-fest, though it comes with more (unannounced) cheese. But it’s a cheery bowl crammed with mini cherry tomatoes, salty caper buds, pungent black olives and bitter wild oregano – and the quality of top-notch ingredients shines through. (We asked whether the cheeses are suitable for vegetarians, and were told that they are). Despite being very full by now, we couldn't resist the classic loukoumades – syrup or honey-soaked puffed fried pastry balls – which here come infused in thyme honey, topped with toasted walnut nibs, and a scoop of kaimaki ice cream, a retro treat flavoured with mastic resin. 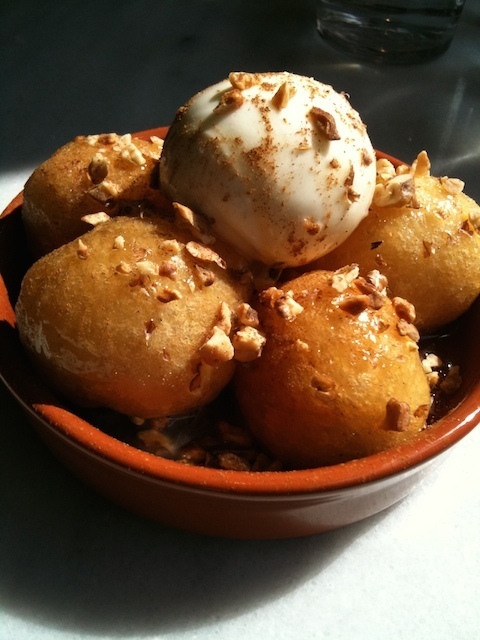 The light, fluffy gulab jamun-like balls hum with sweet, nutty, slightly woodsy and citrusy flavours. The generously-portioned dishes — each to be shared between two or three people — arrive mostly on wooden boards (served by young, friendly staff). There are a few cocktails made from Greek liqueurs; and the wine list includes several Greek varieties, such as the refreshingly tropical Thema 2013 assyrtiko-sauvignon blanc from Pavlidis Estate in Macedonia (it tastes of summer vacations). The veggie fare here is richly laden with cheese, bread and pastry – so the inclusion of some bright, fresh vegetables, salads and sharp flavours would be a useful counterpoint. (We looked longingly at the jars of beans that brighten up the interior – they were nowhere to be found on the menu). Otherwise this is exactly the sort of food you’d want to eat when the sun is shining and you’re in a holiday mood. A lunch of two or three meat-free dishes with a glass of wine and service costs around £20-£25 per person. Opso, 10 Paddington Street, W1U 5QL. Tel: 020 7935 0551.